Sumatec closed @ RM0.115 (+0.005, +4.5%) with 11.24 million shares done on 3 Jun 2016. 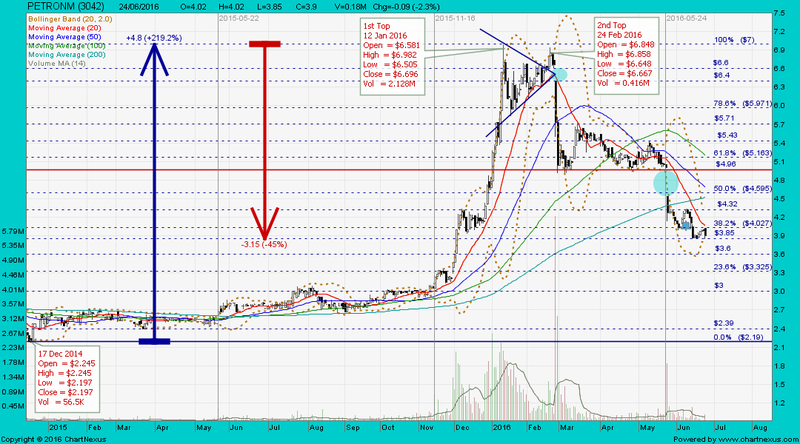 Sumatec closed @ RM0.44 (-27.87%) with 739.24 million shares done on 20 Aug 2014. HOW U READ FRIDAY CLOSING FOR SUMATEC ?? 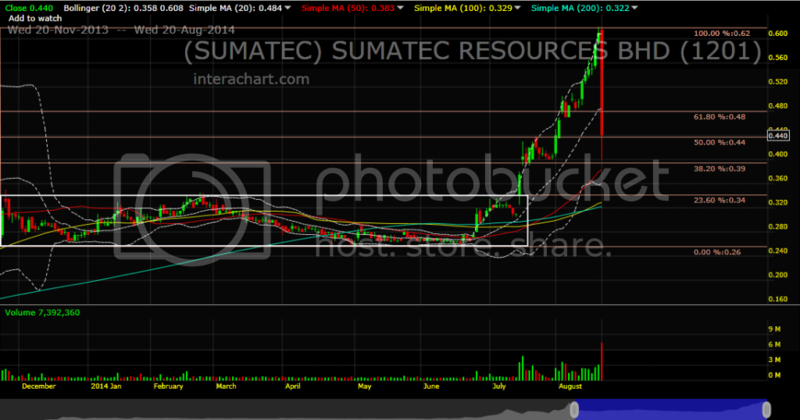 SUMATEC to hit a new low once the last low @ RM0.10 is taken out. SOLUTN closed @ RM0.43 on 3 Jun 2016. 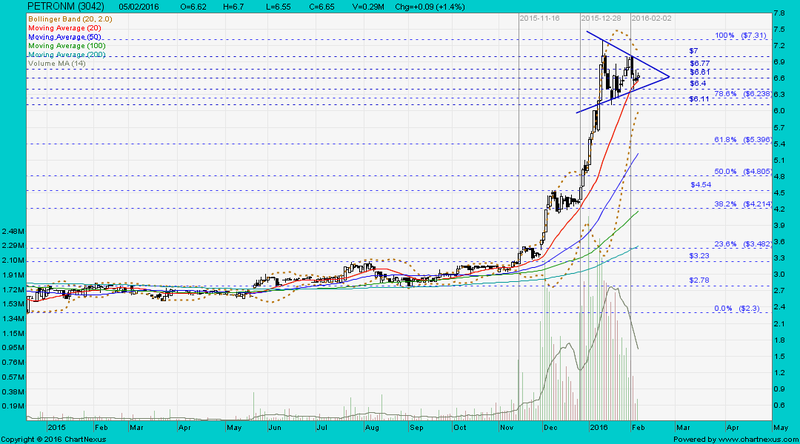 SUMATEC's chart pattern is similar to THHEAVY. What is in store for TH Heavy Engineering Bhd (THHE)? Its accumulated losses stand at RM96mil, it has been excluded from participating in Petroliam Nasional Bhd (Petronas) Carigali Sdn Bhd’s tenders for two years, and lastly, may be hit by bigger losses as there is the possibility of it making more impairments, going forward. Save for something significantly positive happening at the offshore fabrication and marine services company, its prospects look increasingly dim. Based on its latest quarter ended March 31, 2016, its cash is decreasing, down to RM48mil from RM77.6mil in the previous quarter, with borrowings growing slowly but surely to RM408mil from RM406.4mil at the end of last year. 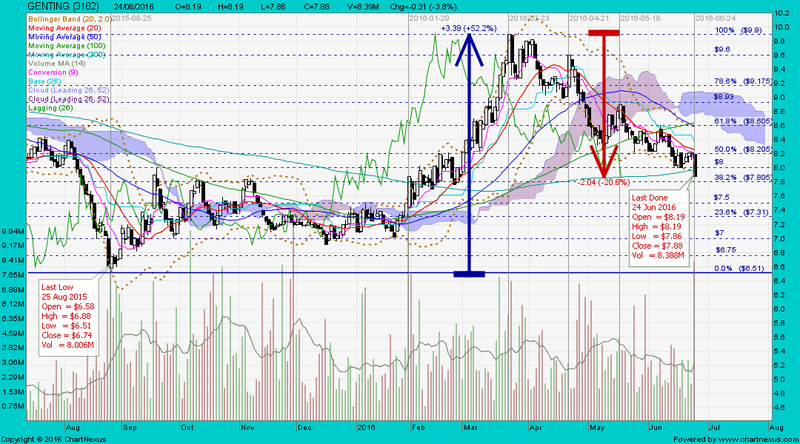 Its share price has plummeted to 11 sen from RM1.03 in February 2014. The good news is, it is actively seeking new contracts for fabrication work. It is hoping to capitalise on its resources at its strategically located Pulau Indah Yard and is focused on winning non-oil-and-gas (O&G)-related fabrication and manufacturing opportunities. 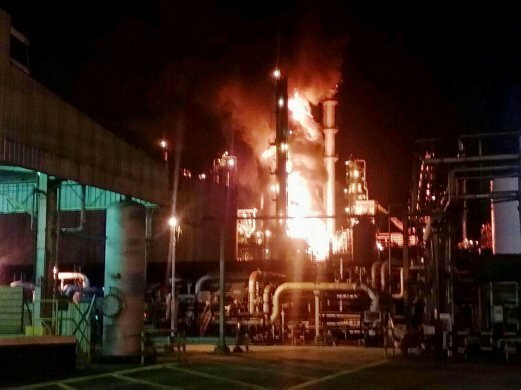 The bad news is, some clients may question the company’s ability to deliver after the sanctions by Petronas. The company has to think out of the box. Perhaps, innovative joint ventures that capitalise on THHE’s strategically located Pulau Indah Yard and a partner with the right expertise is the way to go. And it is right to look outside the embattled O&G sector. Anything less will see the company running out of cash and seeing its accumulated losses nudging it into financial distress, if it hasn’t already reached dangerous levels. OKA closed @ RM1.15 on 3 Jun 2016. 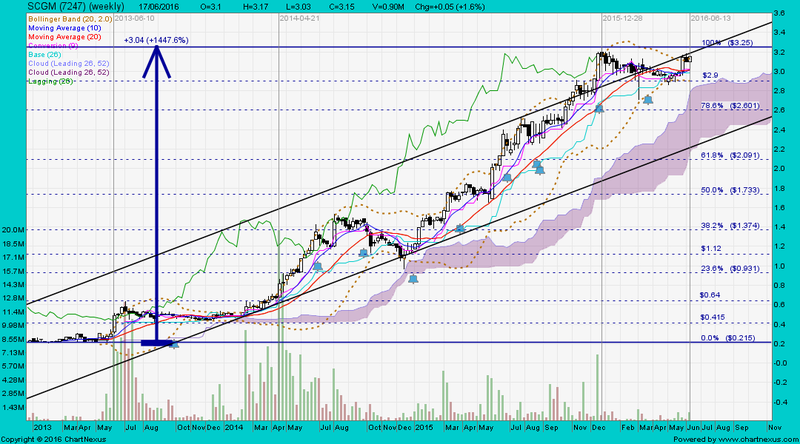 Immediate support @ RM0.475, immediate resistance @ RM0.555. Expect the gap bet. RM0.52 to RM0.545 created on 31 May 2016 to be closed. 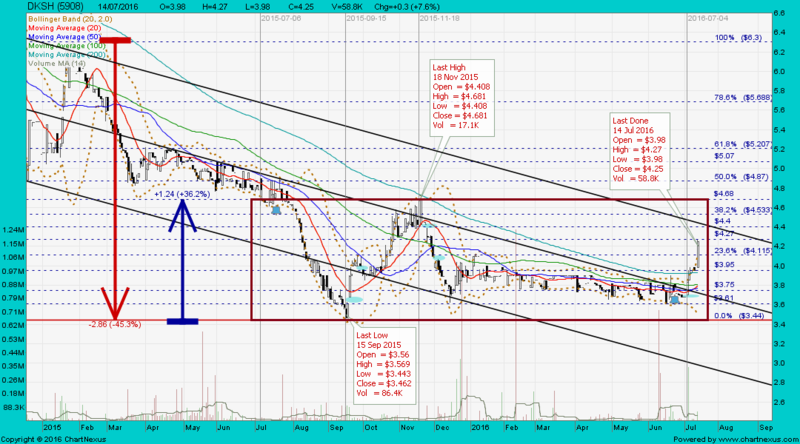 Immediate support @ RM0.46, immediate resistance @ RM0.58. Armada closed @ RM0.71 (+0.03, +4.4%) with 51m shares done on 7 Jun 2016. 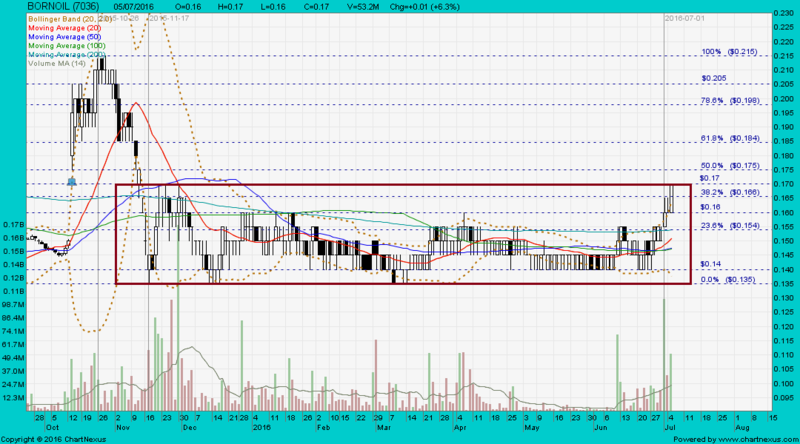 Immediate support @ RM0.65, immediate resistance @ RM0.77. SKPETRO closed with a spinning top @ RM1.74 (+0.04, +2.4%) with 34.7m shares done on 8 Jun 2016. 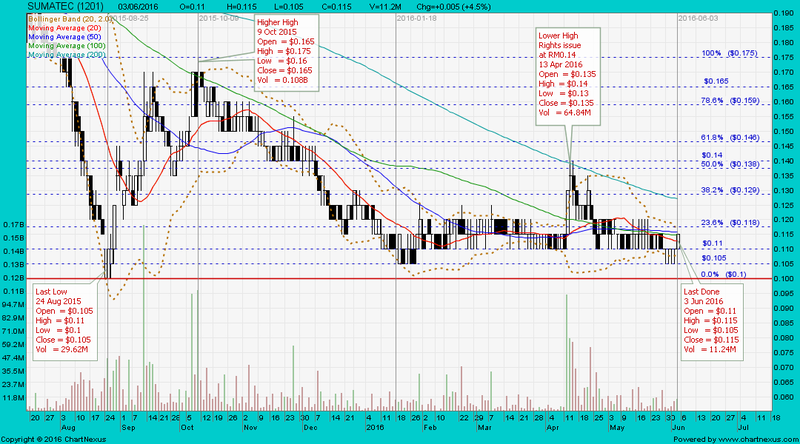 Immediate support @ RM1.69, immediate resistance @ RM1.81. Note: There is a gap bet. RM1.69 to RM1.75 created on 28 Apr 2016. Vivocom closed @ RM 0.29 (+0.01, +3.6%) with 41m shares done on 9 Jun 2016. 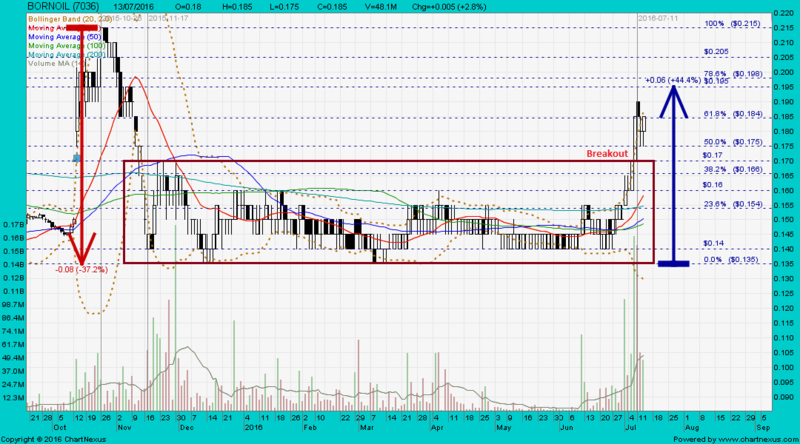 Immediate support @ RM0.28, immediate resistance @ RN0.305. Instacom has been hogging the limelights since November last year. My feel is that if it was just a pump and dump, they would have dumped already. We have to be cognisant of the fact that it is no longer a telco tower kind of company, in fact profits from that industry alone will amount to less than 5% of this year's earnings. So, where is Instacom going? Or should I refer to as Vivocom? a) Anyone who do not believe in their "china-play" story can sell, and would have already... looking at the shaky global developments in recent weeks (oil going below US$30; yuan devaluing; China sending troops to fight ISIS; etc...). No doubt about that, if you don't wish to part of the story, you can opt out anytime and many have done so. 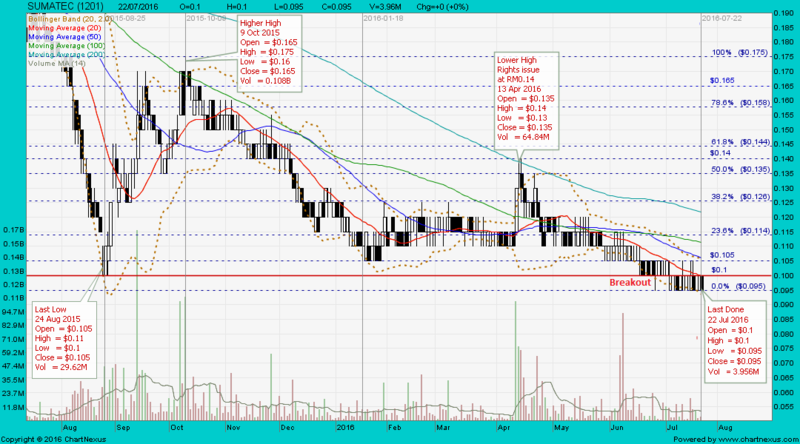 Which is a revealing tell for the price action / volume to see the shares still above 28 sen after all that. b) Hence, despite all that has happened, the share price has settled very nicely above 27.5-28.5 sen. which is comfy above the small 5% new share issue levels. 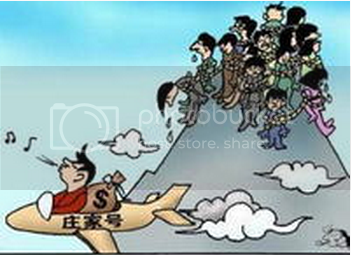 Even if those people wanted to get out, there is sufficient liquidity for them to exit. c) Look at Edra, look at 1MDB, who has been buying? Look at Penang under water tunnel, who had the better financing. Gemas? etc... what else. Its not that Malaysia wants to get China's investments, but no one else seems to be looking or wanting to invest! The Middle East has problems of their own, Japan as well... no one seems keen to provide long term FDI... except China. 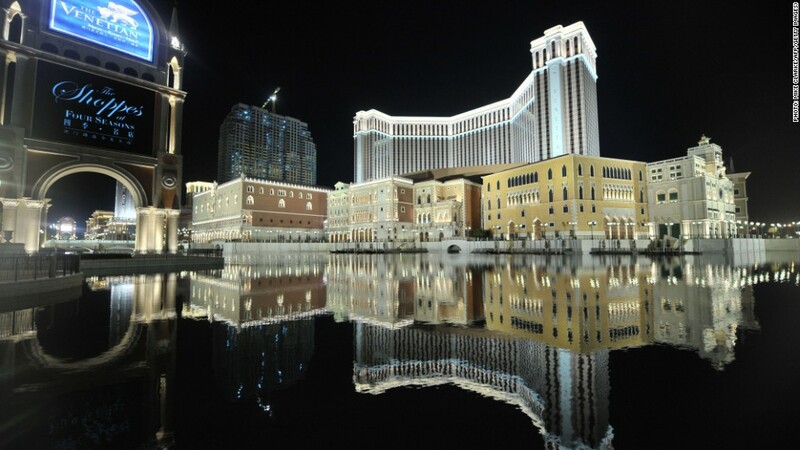 I do not need to go into why Vivocom has a good relationship with CCRC and possibly other China mega counters. Please read the CIMB report. d) Either the entire thing is a scam, or its true... how to scam with CRCC?, the projects are there already, it is one of the top 100 listed companies in China, they can see the news, they can read the blurbs. Yes, it may take some time for markets to give the stock a proper valuation - currently we are looking at less than 5x prospective earnings. I do believe if and when the quarterly figures come in in line or above valuations/expectations, we will see huge spurts then. e) To be fair, you cannot ascribe a 10x earnings on a completely new RTO business, no matter how attractive it may be. 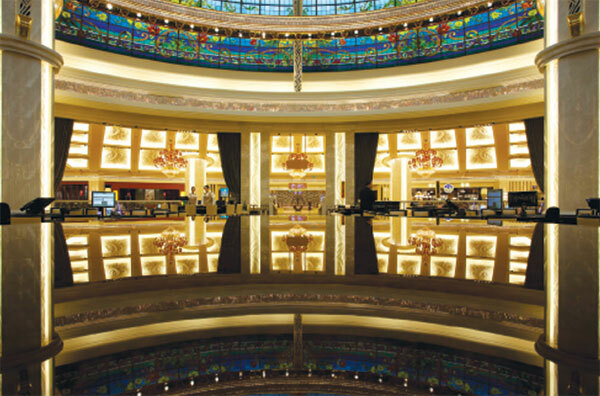 It has to be gradual, as more confirmation on quarterly earnings and new projects being won. To that end, I have just come across a faed technical chartist and got his email on his view on Instacom. Our ways of interpreting data may be different, but I think we come to the same conclusion. SKPETRO closed with a black marubozu @ RM1.43 (-0.09, -5.9%) with 30.3m shares done on 16 Jun 2016. 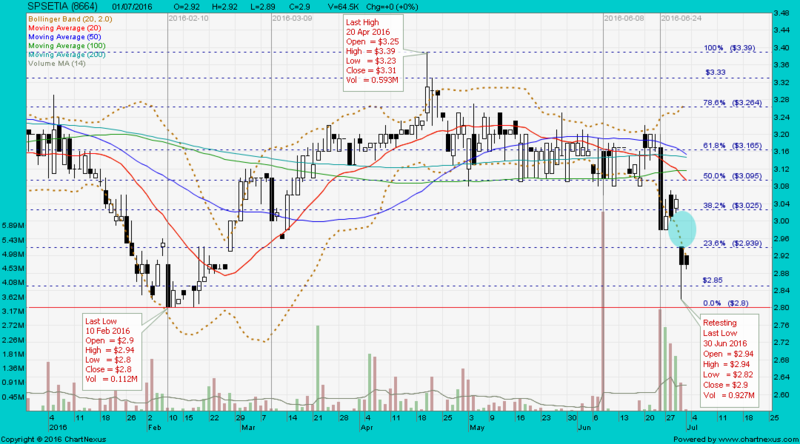 Immediate support @ RM1.36, immediate resistance @ RM1.52. 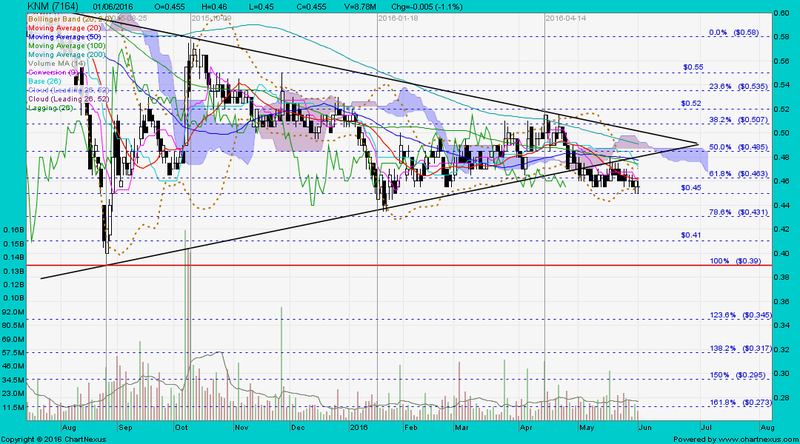 KNM closed with a doji @ RM0.455 (-0.005, -1.1%) with 8.78m shares done on 1 Jun 2016. 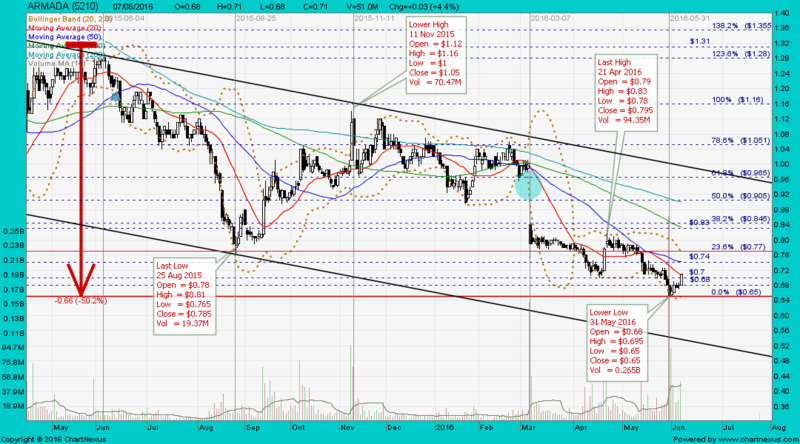 Immediate support @ RM0.41, next support @ RM0.39, immediate resistance @ RM0.46. SCGM closed @ RM3.15 on 17 Jun 2016. SCGM closed with a long white marubozu @ RM3.44 (+0.19, +5.8%) with 1.06m shares done on 21 Jun 2016. 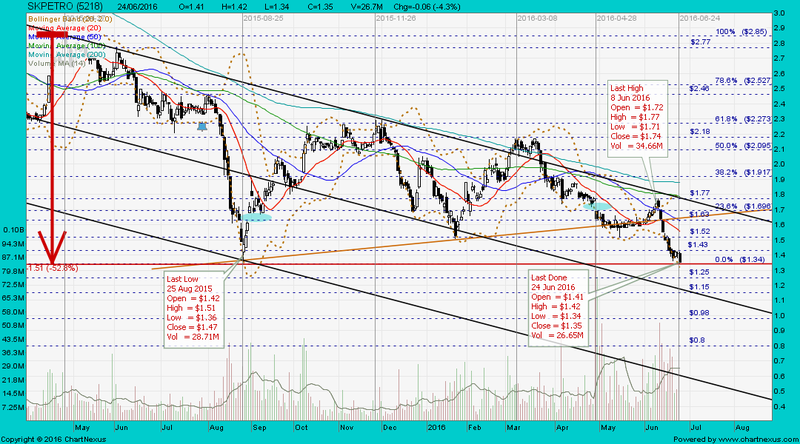 Immediate support @ RM3.25, immediate resistance @ RM3.46. 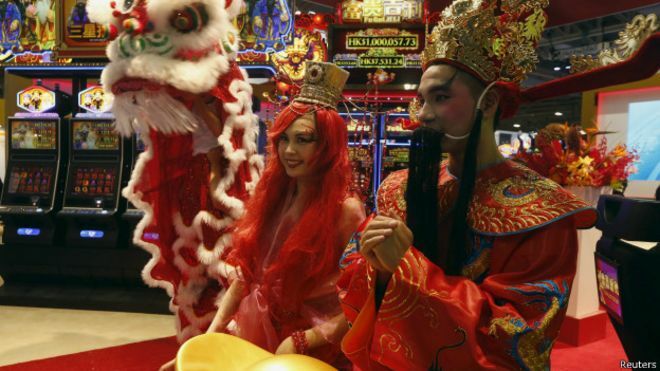 Despite a slowdown in China, the world's largest gaming center is doubling down on its future. Thong Guan closed @ RM4.12 (+0.10, +2.5%) with 980,000 shares done on 21 Jun 2016. 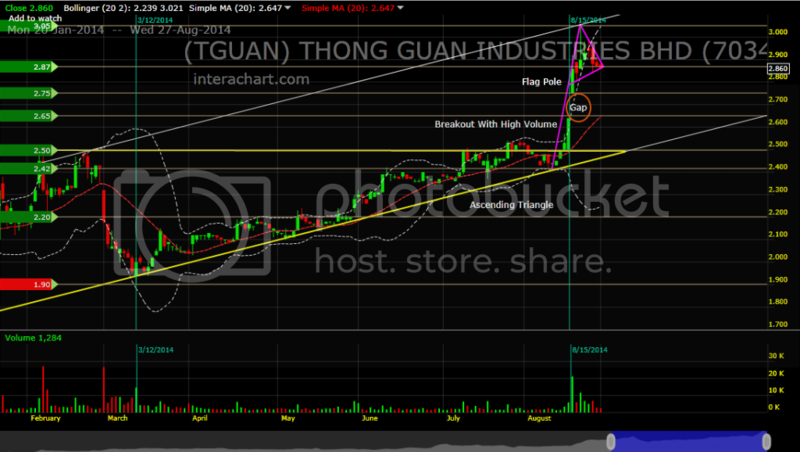 Thong Guan closed @ RM2.86 (-0.02, -0.69 %) with 128,400 shares done on 27 Aug 2014. 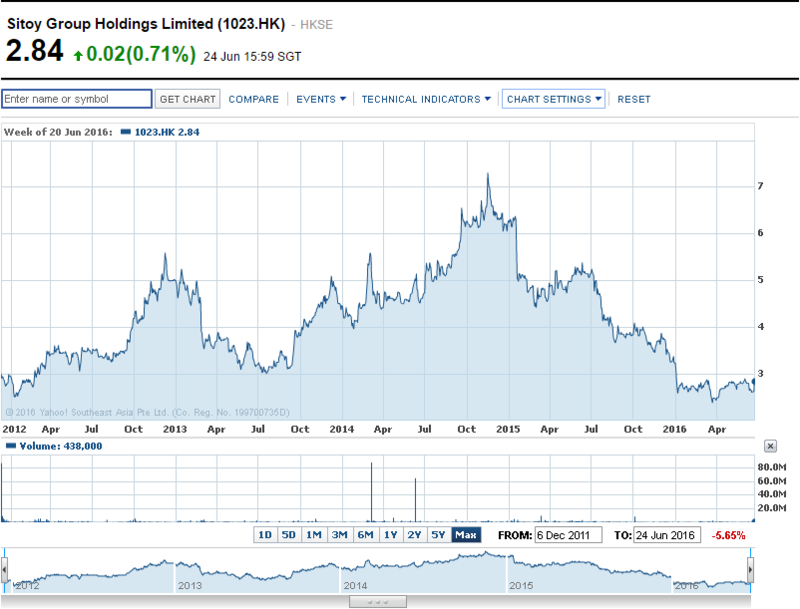 Thong Guan closed @ RM1.45 (-0.01, -0.7%) with 200,000 shares done on 21 Mar 2012. Sitoy closed with a shooting star @ HK$2.84 (+0.02, +0.71%) with 438,000 shares done on 24 Jun 2016. 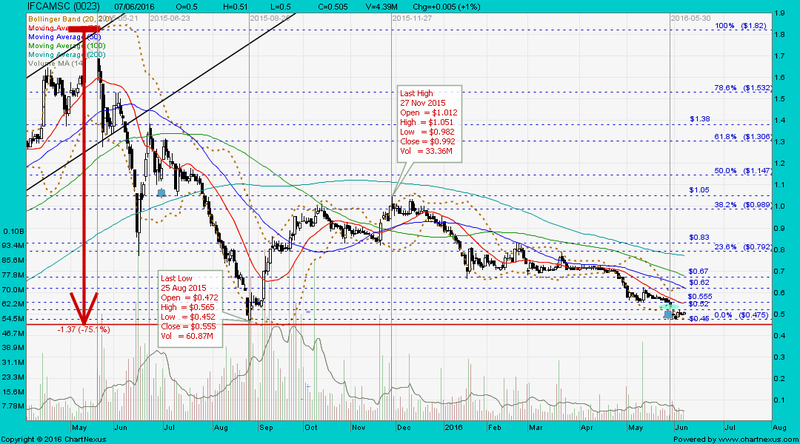 Immediate support @ HK$2.70, immediate resistance @ HK$3.00. Mr.Yeung Wo Fai (楊和輝) is the CEO and executive director of Sitoy. PetronM closed with a hammer @ RM3.90 (-0.09, -2.3%) with 180,000 shares done on 24 Jun 2016. 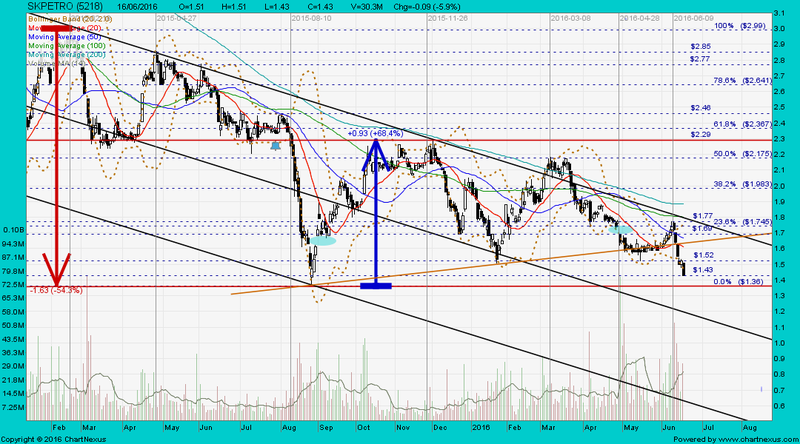 Immediate support @ RM3.60, immediate resistance @ RM4.00. PetronM closed with a spinning top @ RM 6.65 (+0.09, +1.4%) with 290,000 shares done on 5 Feb 2016. SKPETRO closed with a black marubozu @ RM1.35 (-0.06, -4.3%) with 26.7m shares done on 24 Jun 2016. 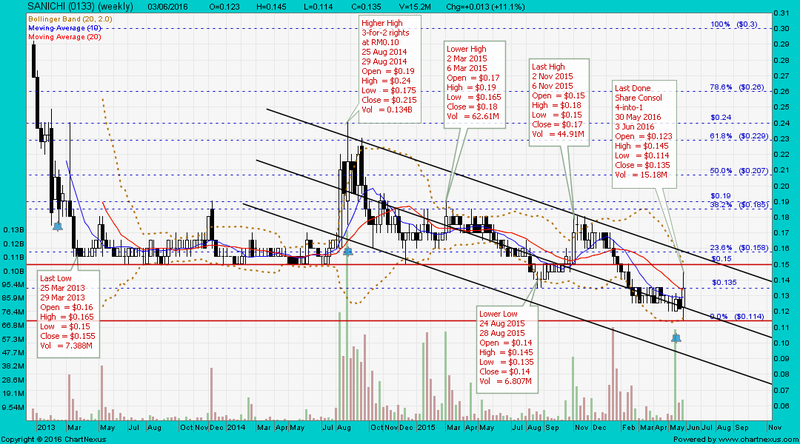 Immediate support @ RM1.25, immediate resistance @ RM1.43. 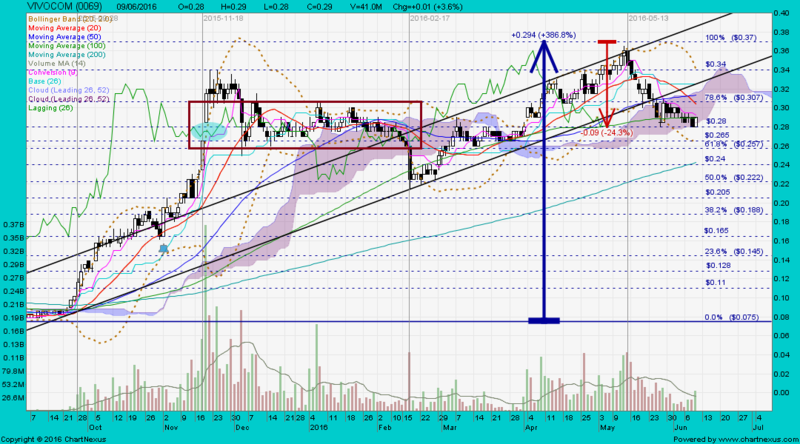 Mr chartist, why Genting fell heavily last Friday? 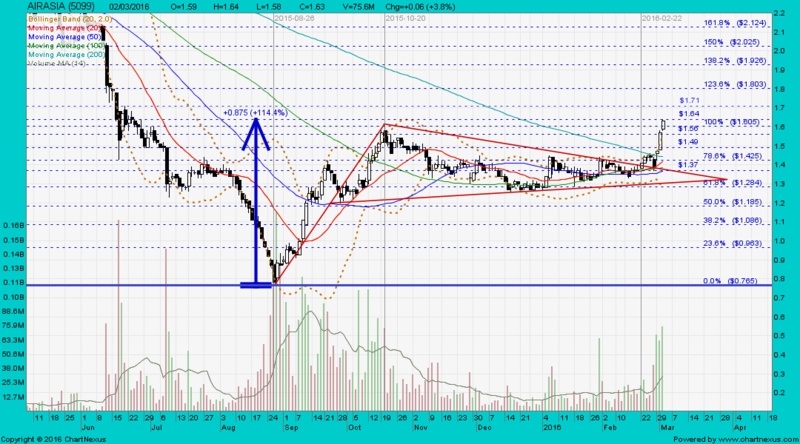 Immediate support @ RM7.80, immediate resistance @ RM8.20. Support level is strong at 1,610 points. In the past one month, the FBM KLCI rebounded whenever it fell to this level, including last Friday when there was strong selling pressure. Despite being bearish in the long term, the bullish divergence on the RSI indicator shows that there is strong support. 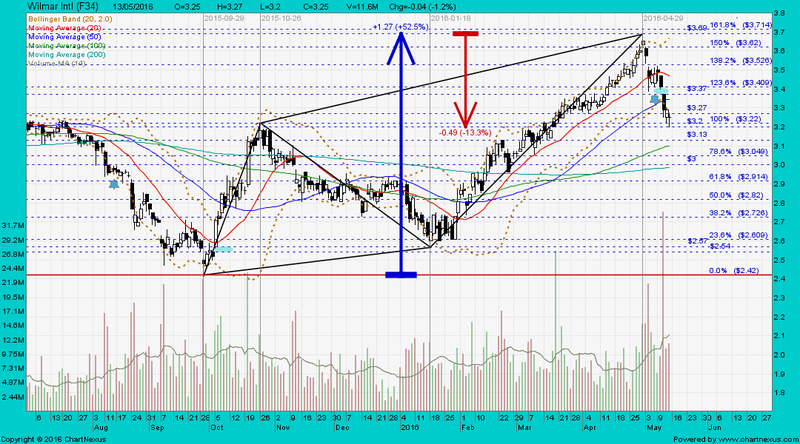 The FBM KLCI is still within the sideways range between 1,610 and 1,640 points. After the UK exit, the market may need some time to evaluate the situation. 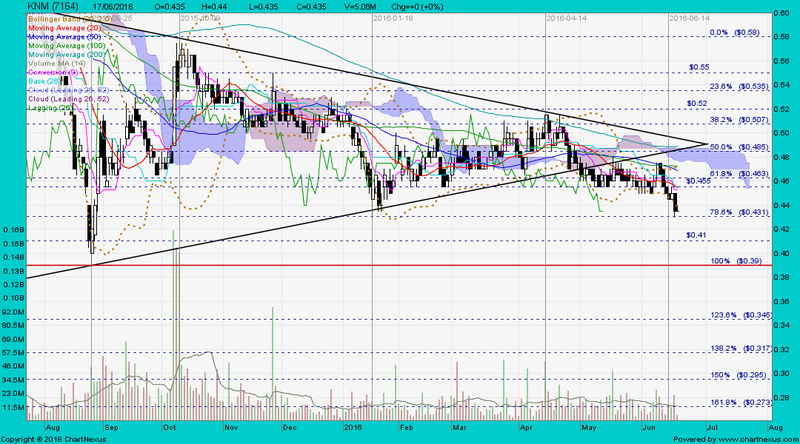 If the FBM KLCI stays between these levels, the market is still uncertain. However, a breakout above 1,640 points indicates a bullish sentiment and the market may start to rally but a breakout below 1,610 points could cause a major decline and we are talking above the index falling to 1,500 points. 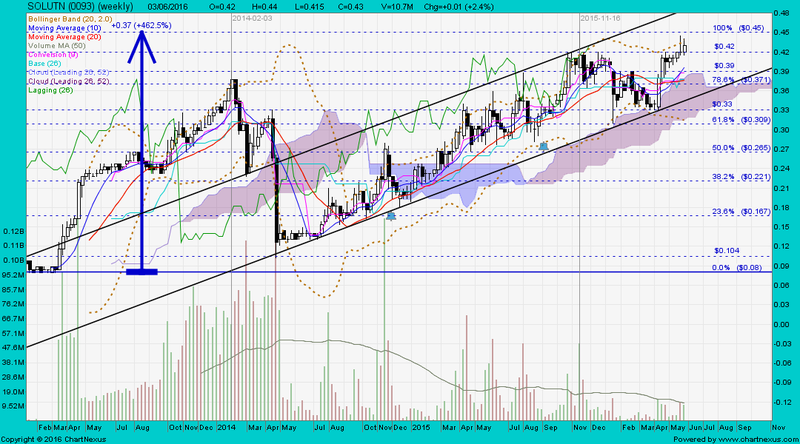 Let’s see which level the FBM KLCI breaks. Can you do a brief research on MAYBULK? Observation: The intermediate uptrend is intact; upside bias, meaning – the stock operator (庄家）is still inside, not yet run-road. MayBulk closed with a white marubozu @ RM0.835 (+0.025, +3.1%) with 4.57m shares done on 28 Jun 2016. 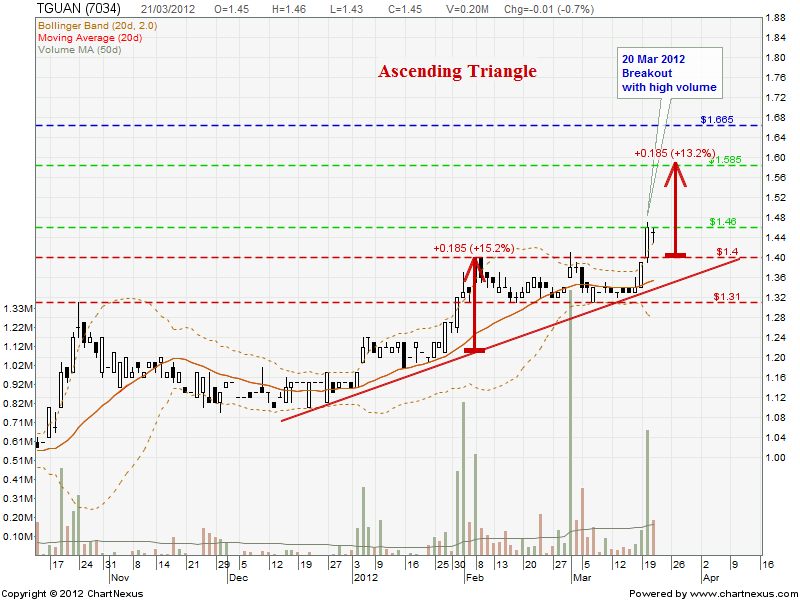 Immediate support @ RM 0.795, immediate resistance @ RM0.87. 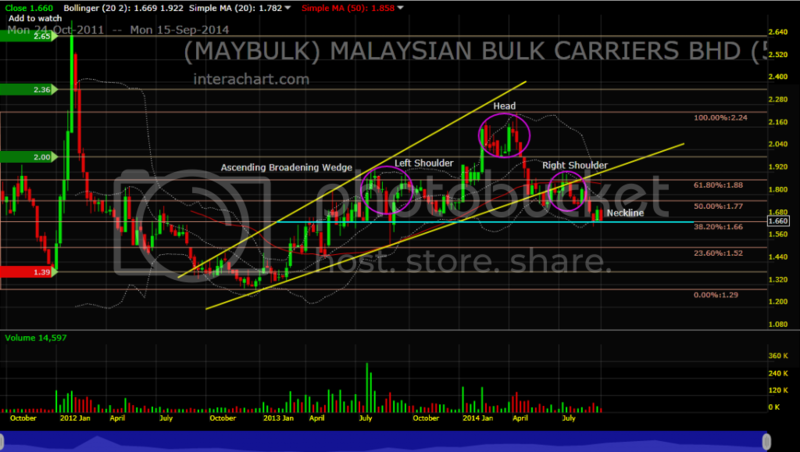 MayBulk closed @ 1.66 on 18 Sep 2014. Sitoy closed with a spinning top @ HK$3.03 (+0.15, +5.21%) with 728,000 shares done on 29 Jun 2016. 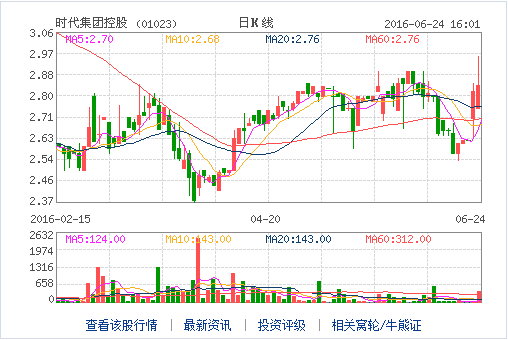 Immediate support @ HK$2.90, immediate resistance @ HK$3.20. Vivocom closed with an inverted hammer @ RM 0.24 (-0.005, -2%) with 70.1m shares done on 29 Jun 2016. Immediate support @ RM0.22, immediate resistance @ RN0.26. Thank you sir for your insight. Bear in mind that you need to minus 19 cents before 30th June due to dividend entitlement. 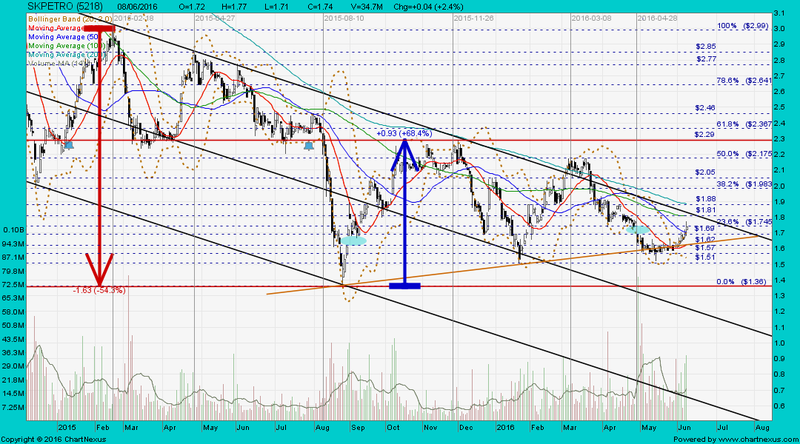 Current support at RM2.90 with upside resistance at RM2.92 and downside support at RM2.88. Neutral trading expected. 1. 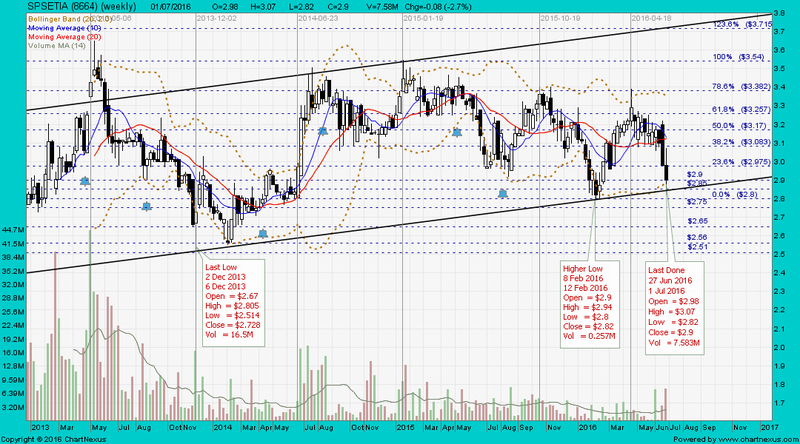 Chartwise, expect SP Setia to retest the last low of RM2.80 and move much further down. 2. Should there be a dead cat bounce due to short-covering — Sell into strength, run road fast. 3. The cash call (rights issue of up to 1.07b new RCPS-i and rhe 19 sen dividend entitlement have already been priced in. 4. The BREXIT -ve impact has not been priced-in yet (re Performance chart below). KNM closed with a gravestone doji unchanged @ RM0.405 with 7.47m shares done on 5 July 2016. 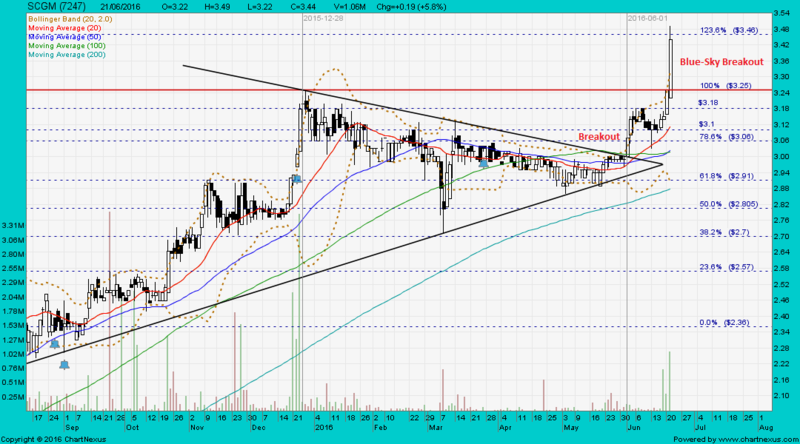 Crucial support @ RM0.39, immediate resistance @ RM0.42. 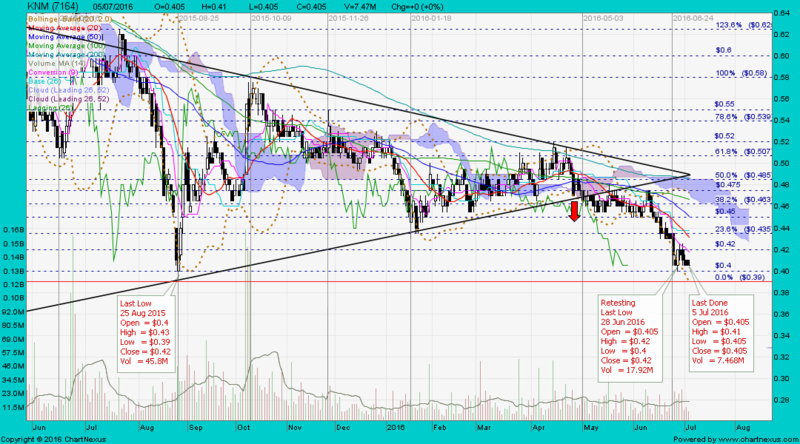 Expect KNM's share price to retest the last low of RM0.39 scored on 25 Aug 2015 and move much further down. AllianceDBS Research said KNM Group Bhd was on a downtrend and that KNM had on July 5 tested previous day’s high of 41 sen before closing unchanged at 40.5 sen. In its evening edition Tuesday, the research house said KNM continued to trade below the 20-day and 50-day moving average lines. “Given the way KNM carried itself over the past 7 days, the stock is likely to move between 40 sen and 43 sen in the coming few days. 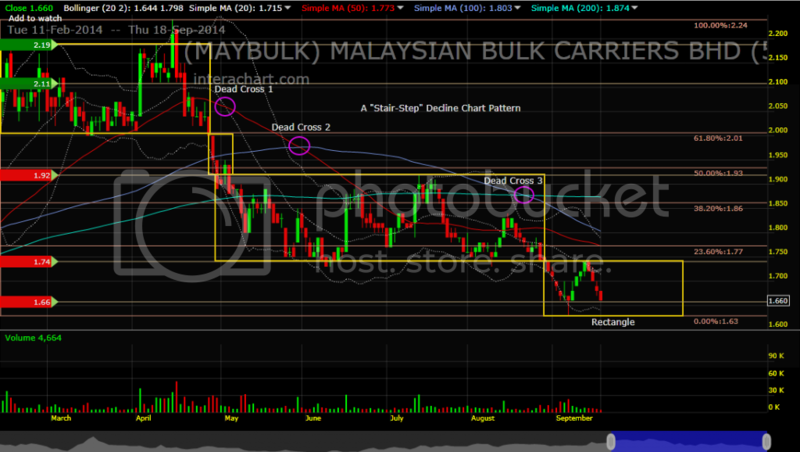 “A crossover of 43 sen should see further price rise to the next overhead resistance at 45.5 sen.
“However, a fall below 40 sen would put pressure on the stock down to the subsequent support zone, 38 sen – 39 sen,” it said. AllianceDBS Research said stock volume traded on July 5 was 7.46 million shares compared to the 3-month average volume of 16.3 million shares. The research house said that indicators wise, the MACD was below the 9-day moving average line with the sell signal remains intact. It said the relative strength index indicated that the stock was currently in a neutral zone. 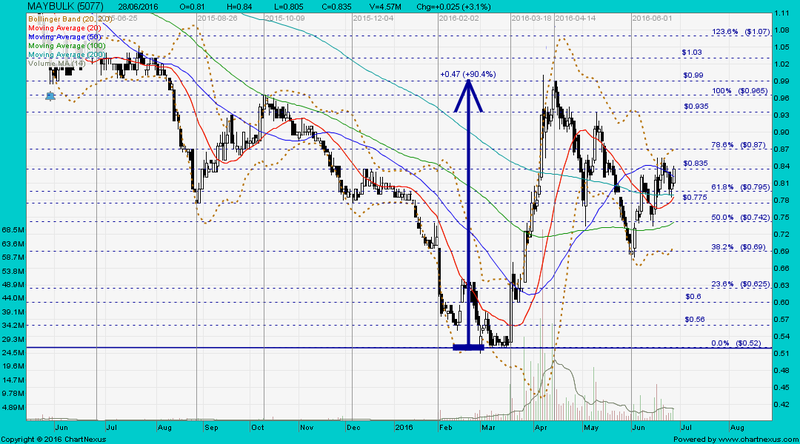 Immediate support @ RM0.165, immediate resistance @ RM$0.185. Well, I had to blog about this because I had mentioned Borneo Oil during last CNY that it was ripe for a transformation play. a) Mathematically attractive - 6 rights for 1 share with 2 free warrants. The rights are priced at just 10 sen. 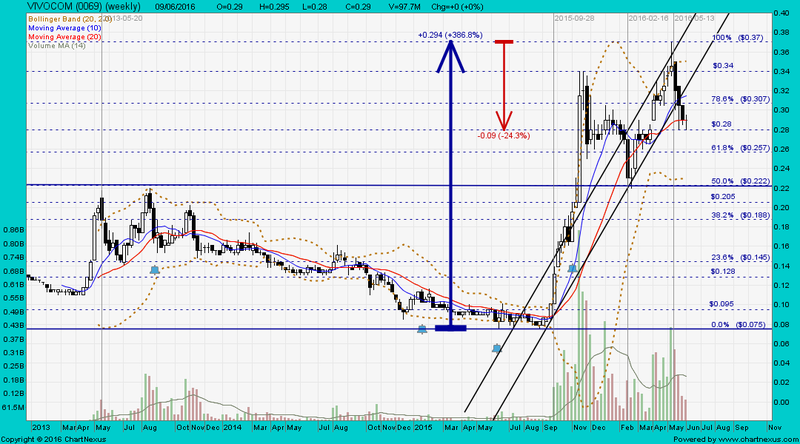 Hence at 80 sen, if you bought 10,000 shares = RM8,000 ... you'd end up with 70,000 shares plus 20,000 warrants. 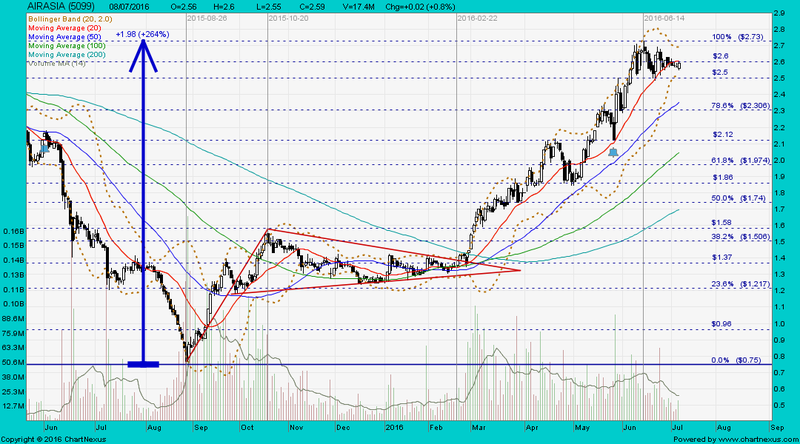 Technically an ex-all price should be around 15-17 sen. Should it trade at that price? Bearing in mind that the new owners (Hap Seng) has literally revamped the company by reducing its par value to 10 sen. Plus it is now profitable with the gold mine having just started ops. So, you have literally a fresh start for the counter ... little or no debt with fresh capital coming from all shareholders. 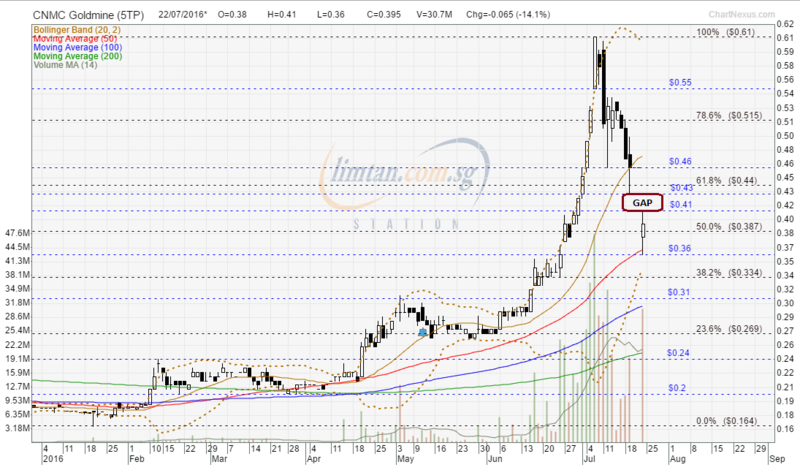 The exercise could raise RM223.39m cash which is approximately the market cap currently. No baggage, established and professionally proven new owners, an uncertain sector (gold mines) but the early steps already indicated that the extraction cost can be controlled and is proving to be profitable already within just a few months. Later on we can expect better economies of scale and expertise to enhance margins further. Hence it would take very little for the share price to go above 20 sen ex-all basis, and in all likelihood the free warrants should be convertible at par value of 10 sen, which would lend a price range of between 9-13 sen for the warrants alone. 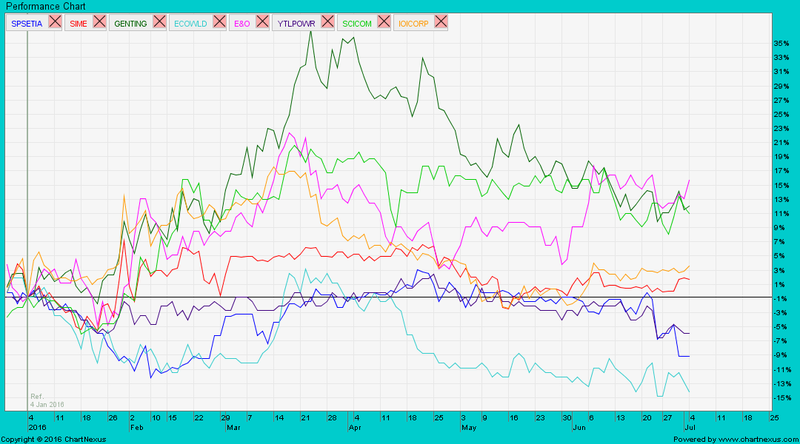 b) Strategic - There is a lot of room for upside owing to the fact that most banks do not lend to mining concerns. Hence you would have come across a lot of mines' proposals but no bank funding. It would take an entity with the clout and capital strength to venture comfortably to extract value in the mines located in Malaysia. I have criticised before how short sighted the local banks and Malaysian financial planners were by not adopting and making mining a strategic choice for promotion. KL could have been the capital for raising funds for the mining sector in Southeast Asia if we have a more concerted effort together. The Ring of Fire (go google it) runs right along most Southeast Asian countries including Malaysia. Yes, the mines may not be the really big ones but we keep losing the fight to Indonesia with plenty of state pension funds and long term investors keen to invest in that sector in Indonesia. Hence it is safe to say Hap Seng would have managed to negotiate a very good value driven deal to absorb the mines and take over Borneo Oil as capital funding is sorely lacking. This is where the kicker comes in. While not much information can be obtained on details of the mines, it is rumoured to be highly attractive terms of short, medium and long term returns. c) A Giant In the Making - Owing to the above structural reasons, there is a solid chance that Borneo Oil will be a mining giant in Southeast Asia. Because, once proven to be able to operate profitably, it can continue to snap up smaller mines via share issuance. 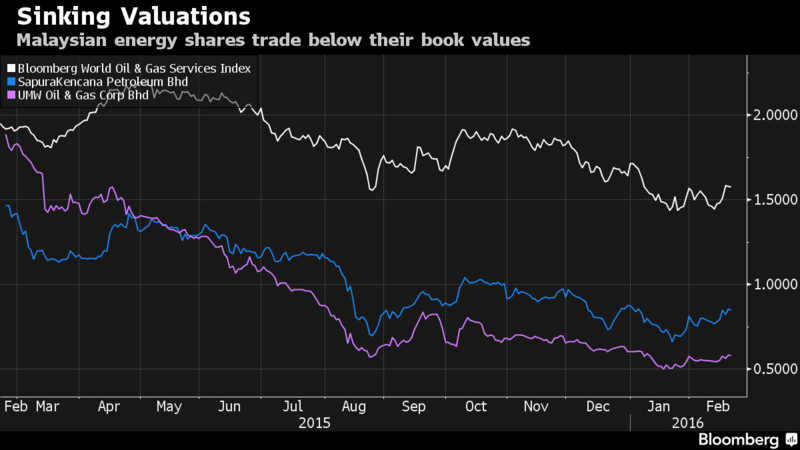 Before you know it, some other listed companies may try to play catch up. Why do you think that decent small mines from Malaysia generally have to list in Australia or Canada, there is no support for capital funding, government promotion and tax breaks, etc... its all oil and gas oil and gas. 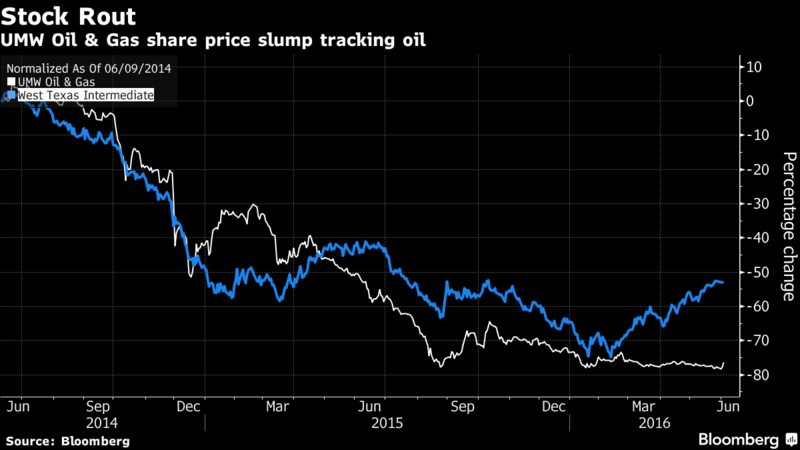 Borneo Oil is actually showing how it can be done, without bank funding. Plus they are not just talking about it, they are themselves putting in more than RM100m cash into it (after paying for controlling shares in Borneo Oil). d) Valuation - No baggage, profitable in a turnaround, massive cleanup in par value reduction recently, 10 sen par with good outlook, professionally proven owners, an undervalued sector that is ripe for harvesting in a coordinated fashion ... plus an inventive rights and free warrants exercise. I put forth a fair value range before going ex of RM1.00-RM1.25. a) As in any mining concern, commodity price fluctuations are part and parcel of being in that business. If prices suddenly get depressed for an extended, mines will have to close temporarily to reduce cost. However, it all depends on the cost of the mining leases that they obtained. If it was deep value then they will only make less money in depressed markets. As explained above, owing to the structure of the industry locally, it is highly likely that the mining leases came at very attractive levels. NOTE: The above opinion is not an invitation to buy or sell. It serves as a blogging activity of my investing thoughts and ideas, this does not represent an investment advisory service as I charge no subscription or management fees (donations are welcomed though). I may already have positions in the stock mentioned above. 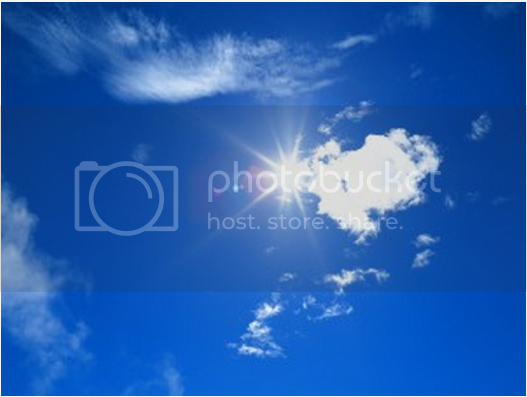 The content on this site is provided as general information only and should not be taken as investment advice. All site content, shall not be construed as a recommendation to buy or sell any security or financial instrument. The ideas expressed are solely the opinions of the author. Any action that you take as a result of information, analysis, or commentary on this site is ultimately your responsibility. Consult your investment adviser before making any investment decisions. Borneo Oil Bhd has proposed a 1-for-6 renounceable rights issue of up to 2.374 billion shares at an indicative issue price of 10 sen per share, together with 1-for-2 free detachable warrants (warrants C) of up to 1.187 billion warrants, at an entitlement date to be determined later. In a filing with Bursa Malaysia this evening, Borneo oil said it intend to raise a minimum gross proceeds of RM223.39 million, the bulk of which will be channeled into the exploration of gold and limestone mining activities, working capital for fast food operations, future investments and repayment of bank borrowings. Borneo Oil said its substantial shareholders – Victoria Ltd (25.48%) and Hap Seng Insurance Services Sdn Bhd (16.72%) have pledged to subscribe in full for their respective entitlements, while the public portion of the right Issue will be underwritten by RHB Investment Bank Bhd. The issuance of the rights issue and free warrants are expected to enlarge Borneo Oil’s issued capital to 3.956 billion shares from 372.319 million shares currently. Borneo Oil is the exclusive sub-contractor for the exploration and mining of alluvial and lode gold in three districts in Pahang — Mukim Batu Yon, Lipis; Hutan Simpan Hulu Jelai, Lipis; and Hutan Simpan Bukit Ibam, Rompin — covering a total of 1,565.1ha. The group also operates a 389.743-acre limestone mining operation in Ulu Segama, Lahad Datu, Sabah. “In the longer term, the company harbours ambitions to become a major player in the gold mining industry domestically and regionally, with the ultimate objective of constantly expanding and strengthening its business base in order to always maximise returns for loyal shareholders. “The board of directors is confident that, with the addition of the gold mining business starting to come to fruition, these positive developments augur well for the financial performance of Borneo Oil in both the foreseeable and long-term future,” Borneo Oil said in a media statement, adding that it expects to complete the transaction by the third quarter of this year (3Q15). The indicative issue price of 10 sen per rights share represents a discount of approximately 41.11% to its theoretical ex-price of 16.98 sen per share, which was based on the five-day weighted average market price of 79.8 sen that was calculated up to April 21, 2015. “For illustrative purpose only, the gross proceeds that is expected to be raised upon full exercise of the warrants C based on the indicative exercise price of 10 sen per share is approximately RM111.70 million under the minimum scenario and approximately RM118.69 million under the maximum scenario,” the group said. AirAsia closed with a spinning top @ RM2.59 (+0.02, +0.8%) with 17.4m shares done on 8 July 2016. Immediate support @ RM2.50, immediate resistance @ RM2.60. AirAsia closed with a black marubozu @ RM0.78 (-0.09, -10.3%) with extremely high volume done at 120,395,500 shares on 26 Aug 2015. 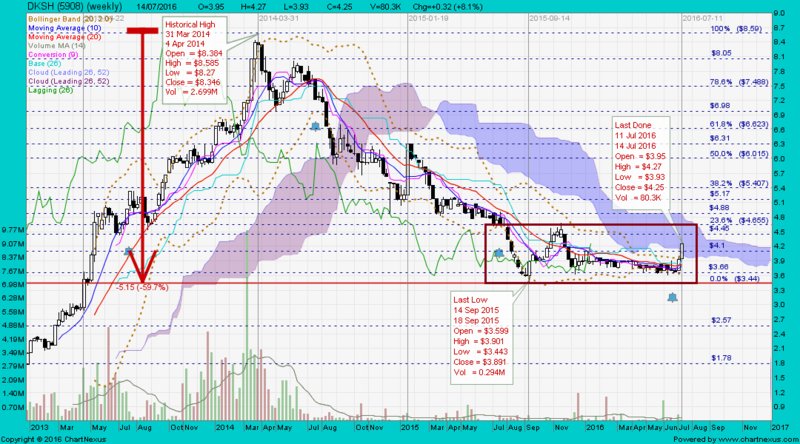 AirAsia closed with a doji unchanged @ RM2.72 with 9.85m shares done on 11 Dec 2012. I hope you can stay in this forum long. "Sell into strength, run road fast" = aim accurately and whack (go short) at strong resistance level. A dead cat bounce is a temporary recovery from a prolonged decline or bear market, followed by the continuation of the downtrend. A dead cat bounce is a small, short-lived recovery in the price of a declining security, such as a stock. Frequently, downtrends are interrupted by brief periods of recovery - or small rallies - where prices temporarily rise. This can be a result of traders or investors closing out short positions or buying on the assumption that the security has reached a bottom. A dead cat bounce is a price pattern that is usually identified in hindsight. Analysts may attempt to predict that the recovery will be only temporary by using certain technical and fundamental analysis tools. DKSH closed with a white marubozu @ RM4.25 (+0.30, +7.6%) with 58,800 shares done on 14 Jul 2016. 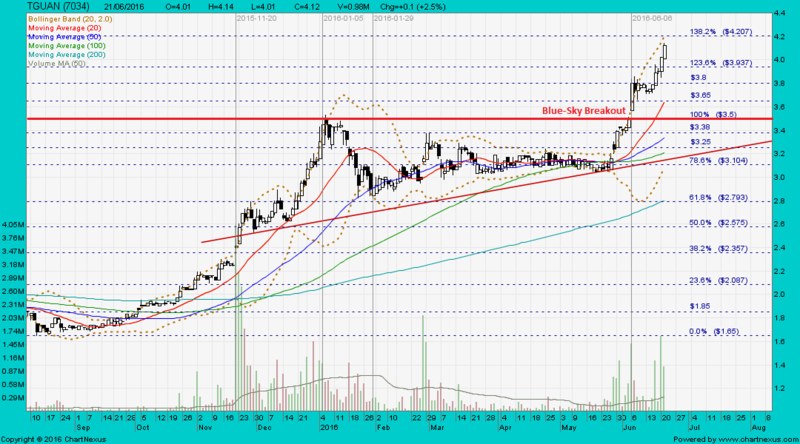 Immediate support @ RM3.95, immediate resistance @ RM4.40. 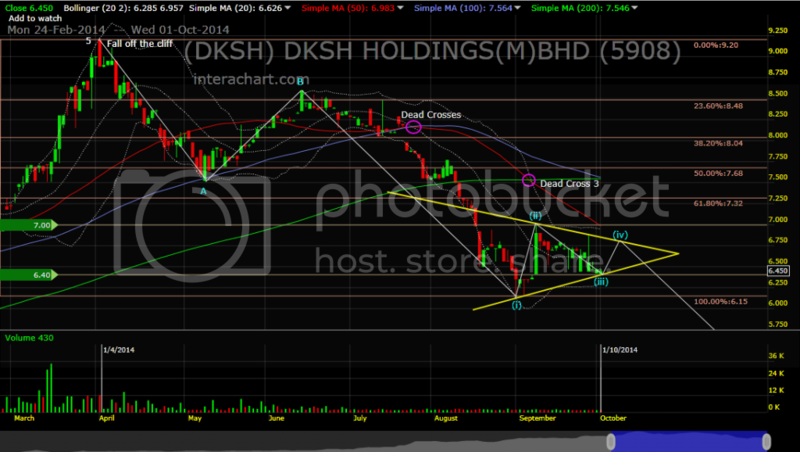 DKSH closed @ RM6.45 on 1 Oct 2014. 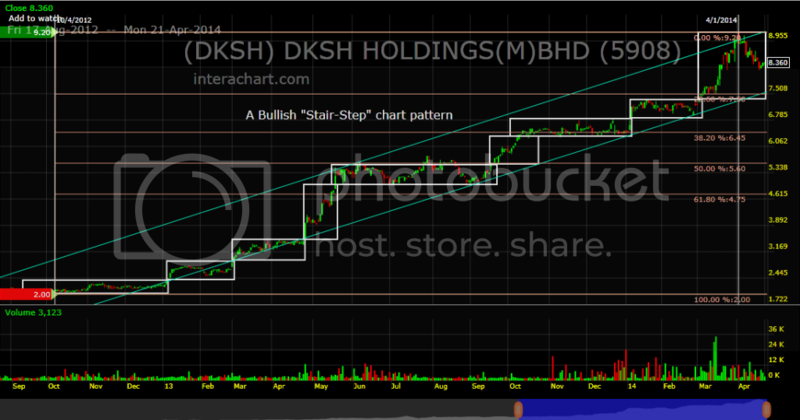 DKSH ~ Hit a record high @ RM9.20 on 1 Apr 2014. Ecoworld had a black marubozu and traded @ RM1.27 (-0.03, -2.31%) with 716,600 shares done on 15 July 2016 at 1230 hrs. 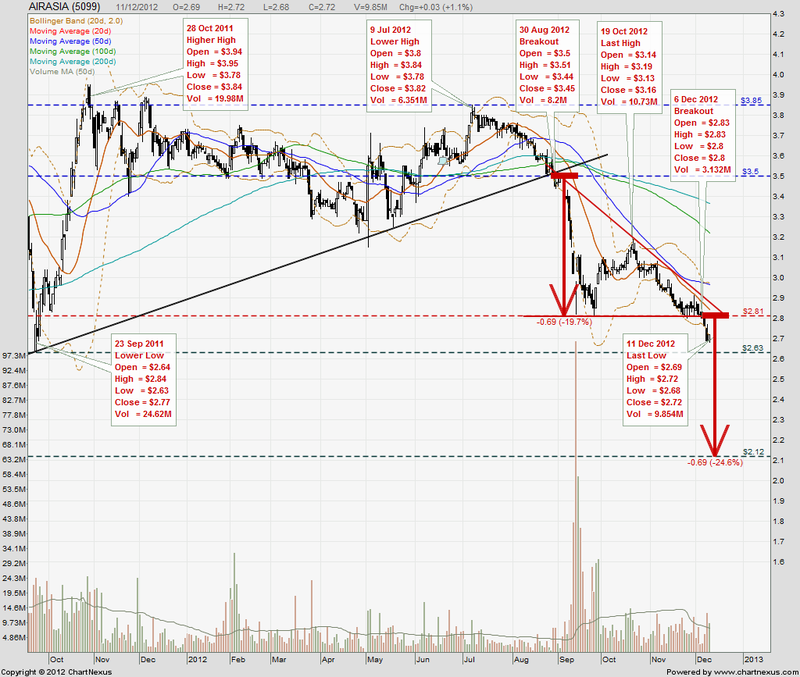 Immediate support @ RM1.25, immediate resistance @ RM1.30. 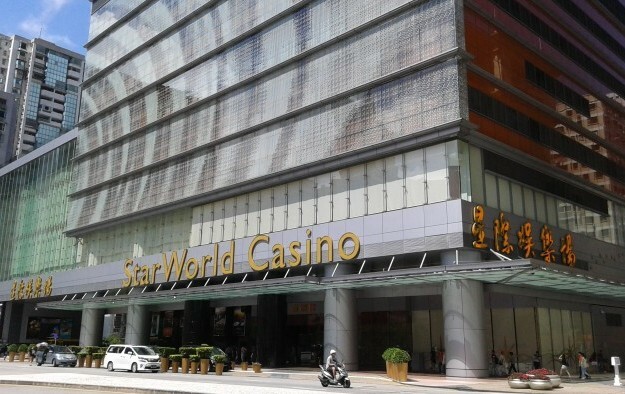 Ecoworld closed with a hammer @ RM1.30 (-0.03, -2.3%) with 3.25m shares done on on 14 July 2016. Wilmar gapped down and closed with a white marubozu @ S$3.16 (-0.19, -5.7%) with extremely high volume done at 62.2m shares on 20 Jul 2016. 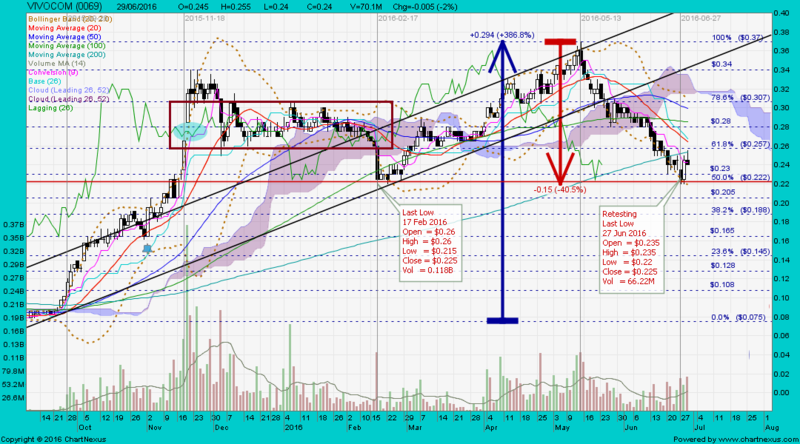 Immediate support @ S$2.91, immediate resistance @ S$3.22. 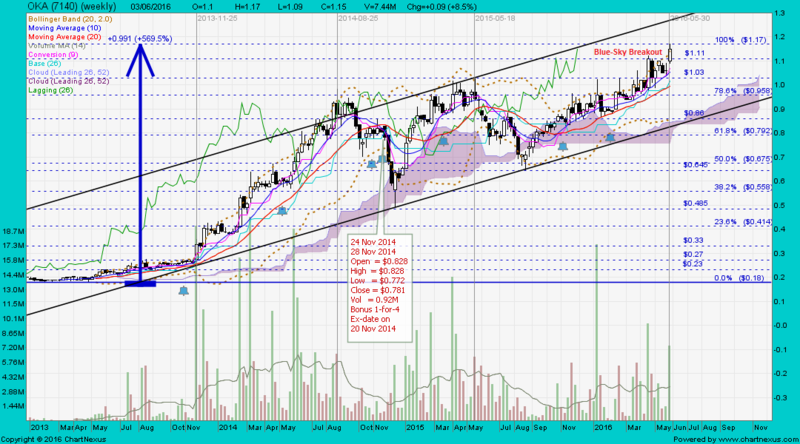 Wilmar closed with a doji @ S$3.25 (-0.04, -1.2%) with 11.6m shares done on 13 May 2016. Wilmar closed with a spinning top @ S$3.30 (-0.01, -0.3%) with 8.8m shares done on 21 Mar 2016. CNMC gapped down with a spinning top and traded @ S$0.395 (-0.065, -14.1%) with 30.7m shares done on 22 Jul 2016 at 0950 hrs. 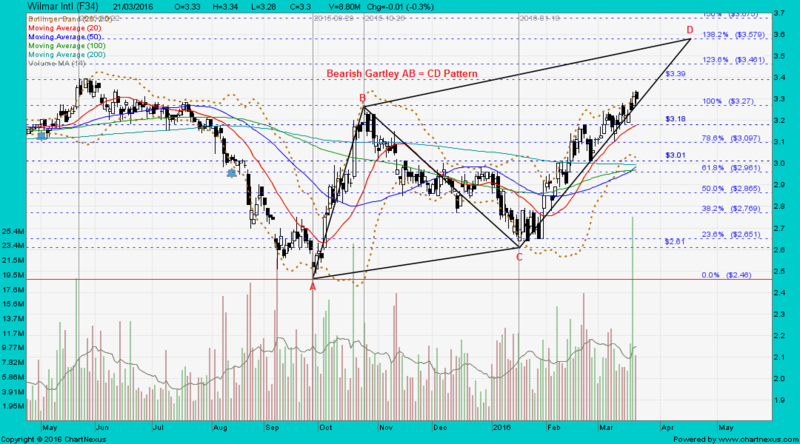 Immediate support @ S$0.335, immediate resistance @ S$0.43. SINGAPORE - Malaysia-based gold mining firm CNMC Goldmine has been notified by the Kelantan State Lands and Mines Office to temporarily stop its operations at the Sokor gold field. The order came on Tuesday (July 19) as part of Kelantan state government's review of CNMC's application for large scale operation status, which will remove the mining amount limitation for its Sokor operations, CNMC said in an announcement on Thursday (July 21). CNMC added that it has worked closely with the relevant authorities and joint-venture partner Kelantan State Economic Development Corporation to ensure the application meets all the requirements. "The board is of the opinion that the temporary stop-work order should be lifted in due course," the announcement added. CNMC shares were last traded at 46 Singapore cents on Tuesday. The company has requested to lift the trading halt. Sumatec closed unchanged @ RM0.095 with 3.96 million shares done on 22 Jul 2016.